To Ask for donations from co-workers for charity purpose is not the easiest task, especially if you are trying to do that at work. But if you follow our ideas and suggestions, you will surely be able to do it at ease. This post has been written exclusively for those who want to raise funds for charitable causes but don’t know how to go about it. The office fundraising ideas and tips enlisted are quite easy to follow and guarantee success for sure! So go ahead and read the post. You will surely find some great ideas from this! 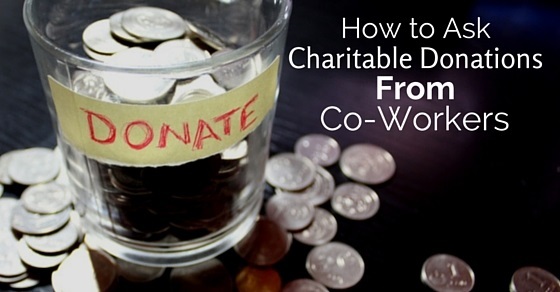 The following mentioned are few tips on asking for donations to charity organizations at work. Even though it seems quite evident, it is very important to have goals that are well defined. This will also help you asking for donations online. So are you trying to raise money for some additional medical expenses. You must always enlist all the expenses that will help others know what they are paying for. It is very easy to get all wrapped up about what you may be asking during donations so that you can forget what you are about to ask people to donate you with. So you should always make sure that your objectives are not all that high up. When you have been asking organizations to make donations to the usual fundraiser, there are several donors who you probably know are those who could be very familiar with you. So it is very important that you aren’t being all that formal when you are writing an email to them or asking for donations because that will come across as something that is false and something that makes them very uncomfortable. It is always okay to begin a conversation with all the pleasantries and ask how they have been. You should catch up with them and bring that up if ever the need arises. Always think of why the donor will care. There is always a big reason as to why people reach out and speak of donations. You should always keep that reason in mind and make sure you are communicating with them when the need arises. You should always approach your potential donor with thinking like that. 4. What relationship does it have with the beneficiary? Maybe this person could have been friends with the beneficiaries. Or maybe they could have been their neighbor. It is quite an appropriate thing to bring up this sort of relationship, especially when you have been asking for donations and are creating some kind of communication that is personal. You may also boost your chances of success in life. 5. Why do these people have reservations? It is also very important to have the thought in mind that there are reasons why someone might not even want to donate money or even address the matter if it is possible. An example can be used to explain this. There are some people who think that they will not be able to make enough money for the donation and that will not make a difference. You may always address this sort of concern and speak about it with a donor and make a list of all the expenses that are specific. They can be paid by making tiny donations so that you can make more charitable contributions. You might not always get a donation from the people you are hoping to get, so make sure you are always open to new things and know how to deal with rejection. Of course rejection does not make you bad at job charity fundraising or that you are terrible or even that the people around you are terrible. Sometimes life will get in the way and maybe it is not all that possible to make donations. But you should never allow that to discourage you. It is alright to follow up politely with those around you. Even though they have rejected you, be nice. Never have too many high expectations while trying to get donors for your company. That is always a bad idea. Because at the end of the day, even though your skills are on point and even though people around you are good, they just might say no because of some reason or the other. So don’t keep thinking that everyone will say yes to you. No matter what has been said to you, always make sure to maintain a good and positive attitude. Your attitude speaks volumes about you so make sure you aren’t giving off any kind of vibes. If it does not help you, there won’t be that many donations. You should always stay positive and let others know how they are impacting their lives as well as donations. It is also a good way to have fun during the whole process. Please don’t always be vague while trying to raise funds. You should always be specific and to the point. We understand there are hundreds of things that might distract you these days but you should work hard enough to always donate your cause and be as specific as you can. You should mention with clarity as to why you are raising funds. You may also enlist a few reasons why you need expenses and come up with examples of successful fundraisers from whom you can take a bit of inspiration. Nobody likes to be in the loop and so the key here is to have some appreciation. Whenever it comes to raising funds, we can assure you there is no simple way to find success. But we can tell that creativity is one method to make success happen. But a very simple tried and tested method can help you use your creativity. You have to tell a story in words or maybe pictures and drawings. You may give rewards to even donors and even send pictures that are drawn by hand, especially to those who are giving you money. You should have a proper themed party so that you can provide for the games as well as food so that people don’t have to donate at the door. Of course there is no end when it comes to possibilities but if you put in a bit of effort and go out of your way, you will surely be able to make a difference. You should always practice before selling. What you are going to tell them, how you will make your points and what will convince them… these are some of the things that you should always think of before even speaking to some of your co workers in the office. Remember what you say will always make a big difference so make sure you are speaking with clarity and react in a smart manner. The more you practice, the better it is for you! Another thing you should always remember is that you should never be too ambitious. Always be open to making new changes and to experience new things. You should have an ambition and a goal of course but don’t make it way too much. That is also a never good idea. You should do as much as you can to get some donations but don’t have unrealistic hopes and expectations. Don’t aim for raising millions or else you will fail miserably. Save yourself from the horror and never be too ambitious at all. Always remember that people want to be heard. So if you want some sort of advice, you will always end up with some money. Asking for some advice always means that people will tell you very freely about the things that they are most passionate about along with the biggest fears that they have about giving. Not just that, they will also begin to understand that the donor would like to feel very important and that they are valued. They are the ones who have more enthusiasm about making changes in the world. So you should always ask them for inputs and impressions. This brings the post to an end. Hope you have learned enough about how to make charities and will be able to do it like a pro from now on. If you have liked this post, don’t forget to share it with your friends. Also if you have tried these tips, let us know how it has worked for you. Apart from that, we would also like to hear a few questions from you. Don’t forget to post them either. We would love to answer all of them. On that note, good luck!